Mold growth in a home or building is always a possibility because the spores that trigger mold growth are constantly present in our natural environment. When these spores find an area with plenty of moisture and a food source, they will quickly form into mold which will spread throughout the structure and cause damage unless it is cleaned up and removed. ServiceMaster 24 Hour provides mold remediation services to remove mold in spaces of 10 square feet or less from homes and buildings in Largo, FL. We are trained and equipped to provide complete mold removal services for contaminations within 10 square feet and we can contain larger contaminations to be cleaned up by a national environmental service company. 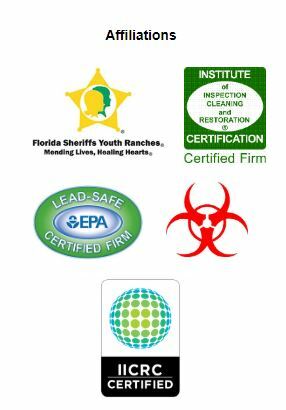 Our technicians are highly trained in matters involving mold remediation and we are committed to providing well-informed and effective services for homeowners in Largo, FL dealing with mold growth. Mold should never be ignored because it can completely destroy the surfaces it grows on if given enough time and it can also contribute to health issues including allergies and respiratory problems. ServiceMaster 24 Hour has the resources and equipment to remove mold from isolated areas within a 10 square foot space if no additional testing is required. If the mold growth covers an area larger than 10 square feet, we will isolate and contain the damage, report the problem to your insurance company, and recommend that the mold remediation is done by an environmental testing service. We are partners with an environmental service company that can provide large scale mold remediation as well as testing and lab analysis at a reasonable cost. As soon as you notice mold growth in your home or building in Largo, FL, make sure to call ServiceMaster 24 Hour for mold remediation services. We can effectively remove mold growth from areas within 10 square feet and refer larger contaminations to our environmental service partners who can provide testing and complete mold remediation services.